His cherished little sister decides to run off and get married on the sly . . . and then a freak car accident takes her out of his life for good. As Kohei's heart struggles to mend in the wake of family tragedy, who should show up on his doorstep but his once-despised brother-in-law Shingo? Suddenly, Kohei's days and nights are ruled by torturous nightmares . . . and a strange, sweet longing. Will Kohei let Shingo see him at his most vulnerable, or will he keep his door locked forever? . . . . Thanks to a life marked by one tragedy after another, bitter Kohei is certain that he'll never know true love. 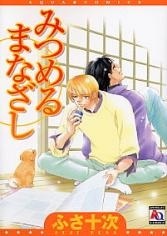 However, his brother-in-law Shingo can't help but fall for the very man who despises him! In order to survive, these two men must admit to their secret wishes and face their deepest fears . . . together!